​Dr. Trina Hazzah was born and raised in Washington DC. She attended Tuskegee University School of Veterinary Medicine where she earned her Doctor of Veterinary Medicine in 2006. 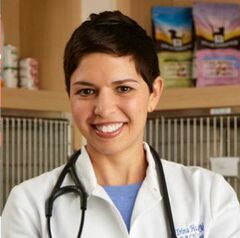 She completed her small animal internship at Red Bank Veterinary Hospital in New Jersey and a 3-year residency in medical oncology at the Veterinary Oncology and Hematology Center, in Connecticut. She has also completed the requirements to be a Certified Veterinary Chinese Herbalist from the Chi Institute of Traditional Chinese Veterinary Medicine. ​Dr. Hazzah's area of interest is Complementary and Alternative Medicine (CAM) and offers a novel approach to veterinary cancer therapy by combining conventional Western therapies with complementary Eastern therapies to provide a whole patient treatment approach. She feels that quality of life is an essential priority in the treatment of every cancer patient and strives to find a perfect balance between effective treatment while optimizing patient comfort. Her interest in cannabis medicine developed during her quest for finding effective integrative approaches for pet cancer patients. When her own cat developed a highly aggressive lung cancer, cannabis was the only modality that drastically improved his quality (and quantity) of life. As a result, she has spent the last four years reading though available literature, attending cannabis conferences and symposiums and learning from cannabis physicians. She has since given numerous lectures to veterinarians educating them on the topic of cannabis medicine. Dr. Hazzah is a member of the Society of Cannabis Clinicians, Canadian Association of Veterinary Cannabinoid Medicine, Veterinary Cancer Society, American College of Veterinary Internal Medicine, American Holistic Veterinary Medical Association Conference and American Veterinary Medical Association.